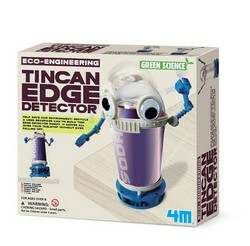 Explore the exciting worlds of robotics and green science with the 4M Green Science Tin Can Edge Detector Robot Kit. 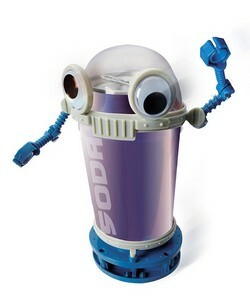 Assemble the robot using a recycled soda can for a body and turn it loose to roam around a table. Sensors in the robot's base detect the table and turn it aside every time. Requires one soda can and one AAA battery, not included. Recommended for ages 8 and up. 4M educational toys cover a wide range of subjects and include science kits, arts and crafts kits, robotics kits, and more. 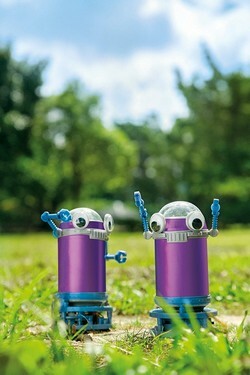 Each toy is creative, imaginative, inspiring--and most of all, fun! They encourage your child's inquisitive nature while teaching them to explore the world around them. 4M is recognised as one of the premium brands in the educational toy trade. Since 1993, innovation, creativity and positive brand building have been at the heart of everything we do, together with a relentless commitment to excellence. Growing our company by growing our brand. Enabling children to play and experiment safety is the most significant factor in the design of our products. We support and endorse the on-going work to improve the safety standards in the international market. In the face of ever increasing levels of regulations, we ensure quality is maintained through regular testing and always reach the most up-to-date requirements in both the EU and USA. Pre-launch of every product is subject to rigorous lab testing that covers amongst other things like sensitivity material testing for wet paint, plaster powder, plaster block and glue as well. Commitment and collaboration have helped us win more than 70 local and international awards since 2003. An impressive 28 of them were won in the last two years alone. Being recognized by leading industry bodies for the work we do gives us great pride and satisfaction. It validates the distinction and safety of our products and highlights our constant corporate drive for excellence.